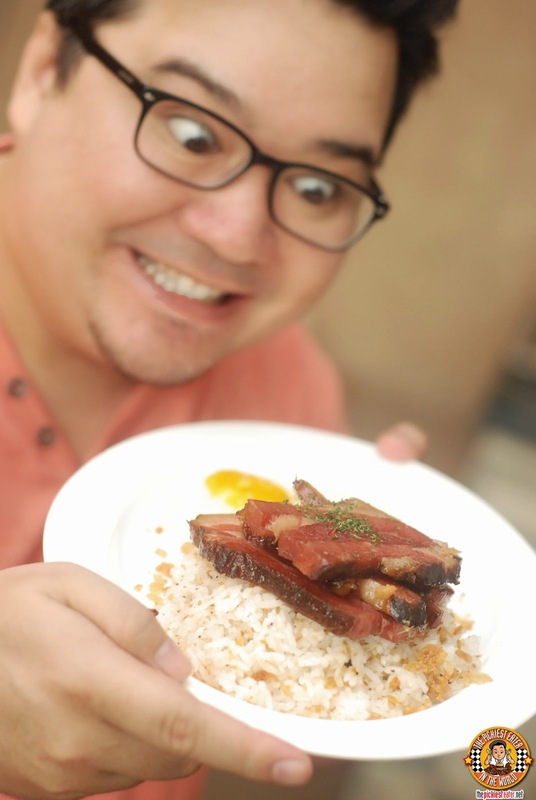 THE PICKIEST EATER IN THE WORLD: DULCELIN GOURMET: FROM GOURMET DISHES TO DESSERTS! 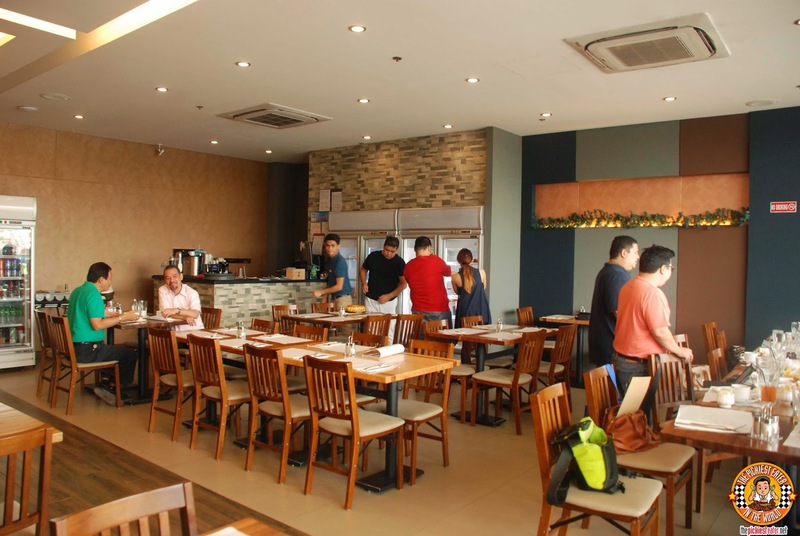 Located at the second level of the growing UP Town Center, The dining area of Dulcelin Gourmet has rustic touches, complete with clean, modern flourishes. 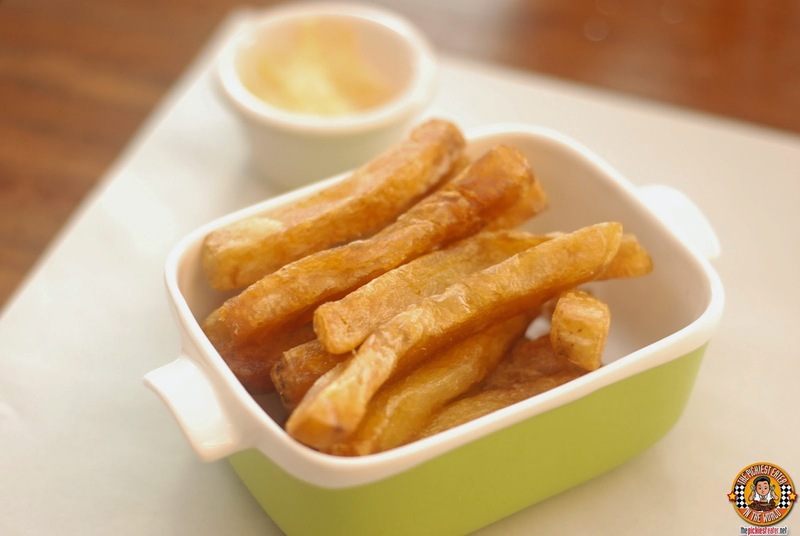 I strongly suggest you start off your meal with their Old Style Fries (P120). As much as I love McDonald's French Fries, it's common knowledge that their fries are processed and frozen, before devoured by the masses. Dulcelin Gourmet made sure their fries were done old school. Hand cut unevenly to add to the charm, then fried in beef fat (tallow). This is the kind of dish you hide from your other companions in the table. The kind of food that you risk friendships for. The fries were more savory and flavorful than other mortal fries. There was something incredibly comforting about this, and given the fact that it's served with mayonnaise instead of ketchup, the exact way that I eat my fries, only added to that notion. 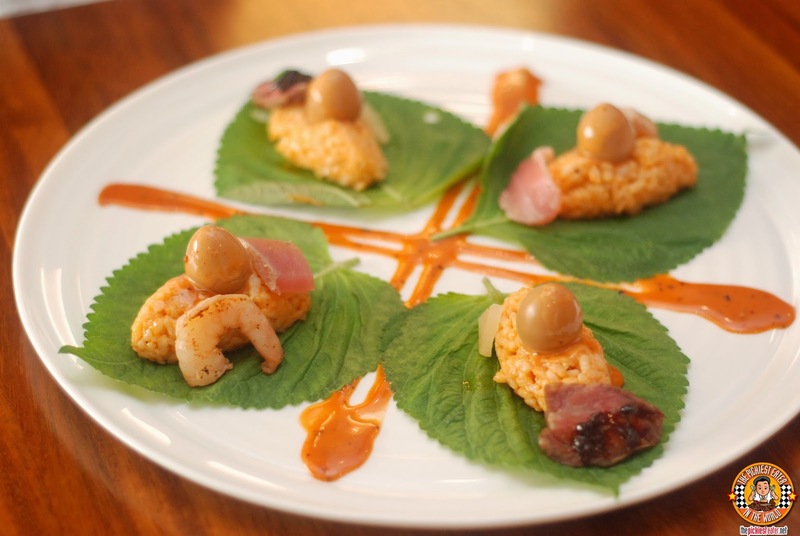 Another dish from their starters menu that we had was the Red Rice Shiso Duo (P240). This was seared tuna with shrimp and Snake River Farms Wagyu Skirt Steak with Pickled Radish and Aji Tamago Quail Egg on a bed of Japanese rice mixed with Korean spices and Shiso leaves. This was my first time to ever try a Scotch Egg (P200 single / P395 for sharing). Whenever I see it in a menu, I always skip over because I have a disdain for hard boiled eggs. 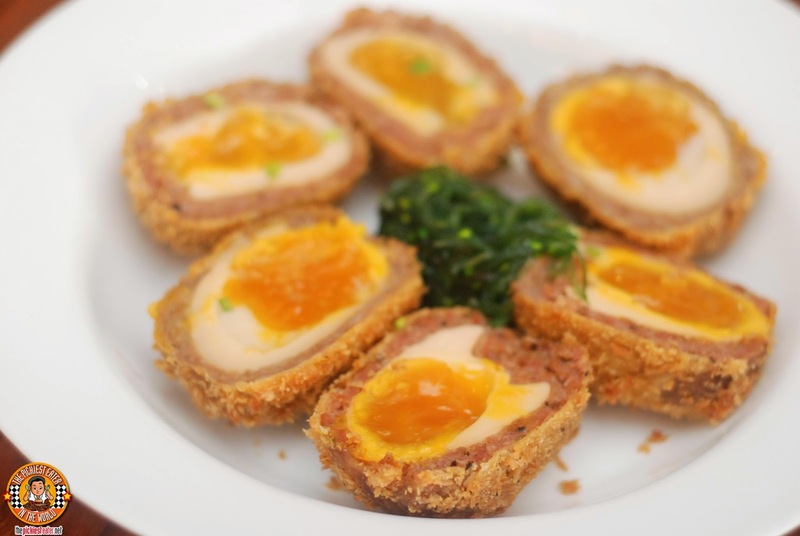 This time though, when they presented the Scotch Egg to us, I had to admit, it looked very appetizing. The egg yolk was not hard like a hard boiled egg.. Instead they managed to keep it a little soft and wet. The marinated egg is packed with flavorful Italian garlic sausage. 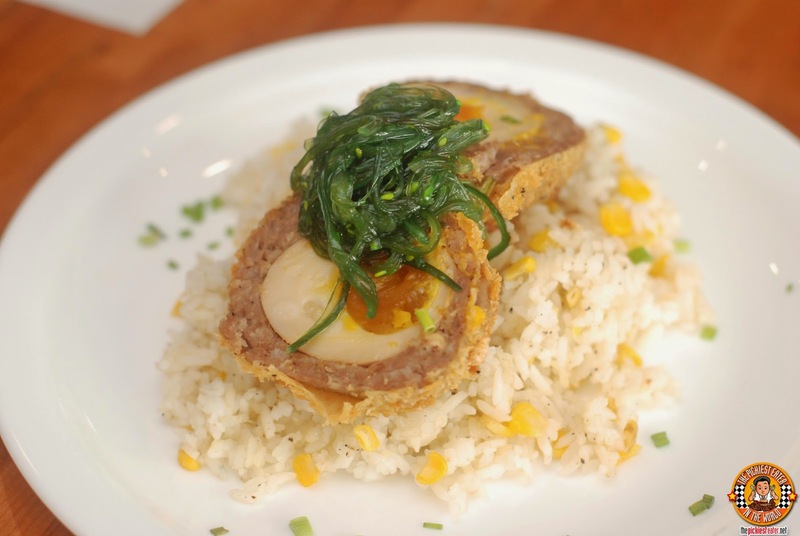 Breaded then fried Served with a choice of miso corn rice and seaweed salad. A dish that they had which didn't particularly interest me was the Uni & Shrimp Pasta (P350 solo/P625 for sharing), which has a Limited availability. 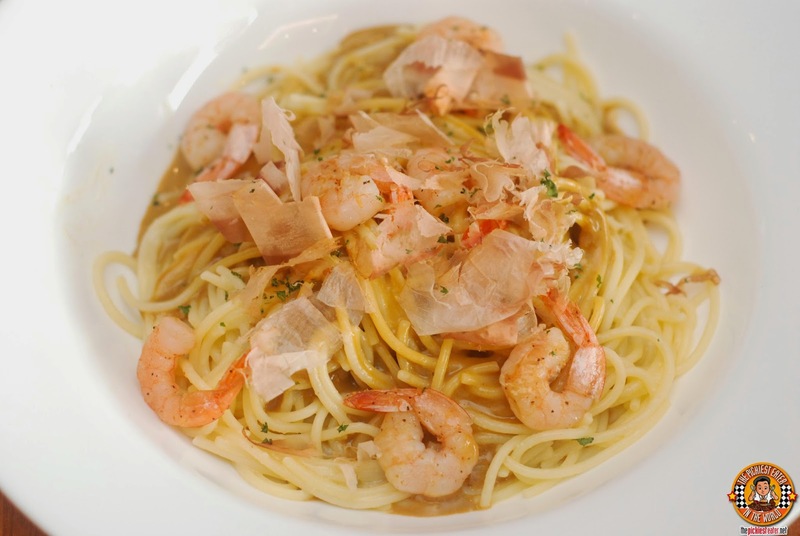 Bits of the creamy Sea Urchin and shrimps are transformed into an oil-based pasta sauce. Because it had shrimp, it endeared itself to Rina immediately. Another dish that really brought out the Picky Eater inside of me was the Lengua (P330 single / P600 sharing). I'm certain that there's nothing wrong with the taste but the mere thought of eating an ox tongue, no matter how tender it is, just doesn't sit well with me. 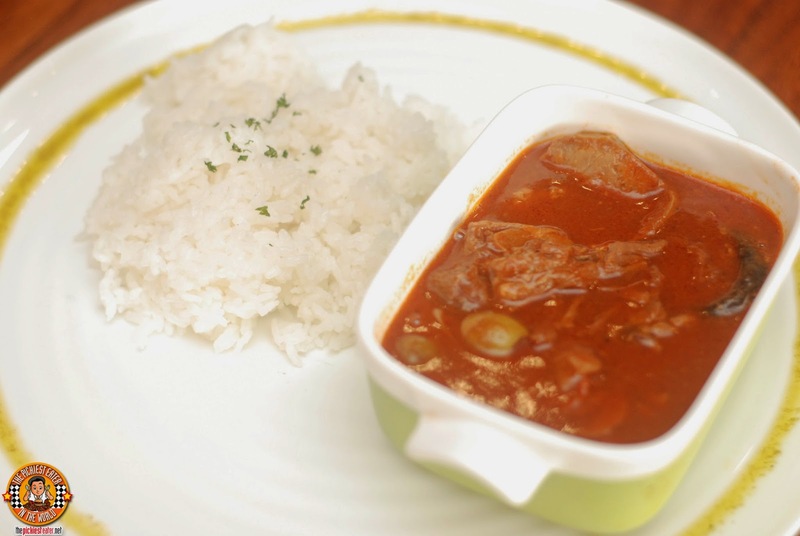 The said ox tongue smothered in Dulcelin's rich, brown sauce, with some Chorizo El Rey and Mushrooms mixed in, and is served with steamed rice. Dulcelin takes its cue from the classic Cordon Bleu, except the chicken breasts are poached, instead of breaded and fried, making it a tad bit healthier (I said "a tad", didnt I?). The Chicken Breasts are stuffed with a cream cheese mixture made with garlic and US Smithfield Ham added. 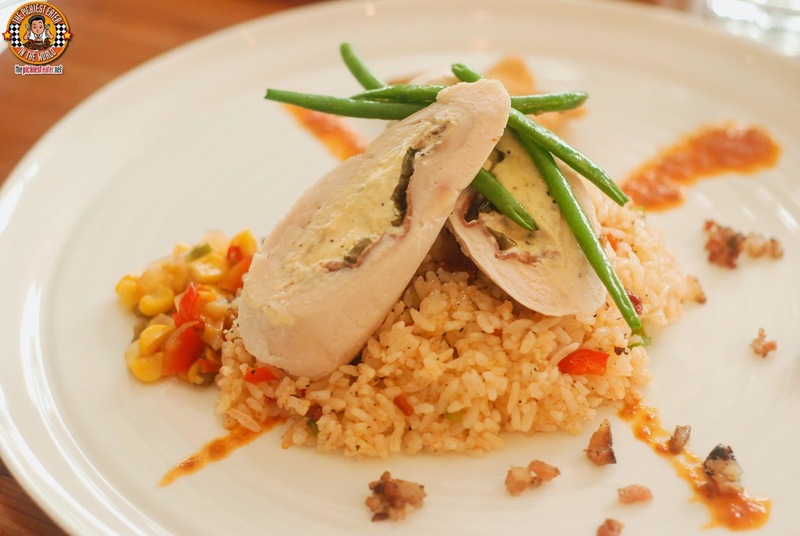 The chicken is served with Chorizo Rice, Pickled corn relish and bacon sautéed French beans with a bell pepper sauce. There are certain dishes that cause a room to stop and gasp, the moment it is brought out of the kitchen. 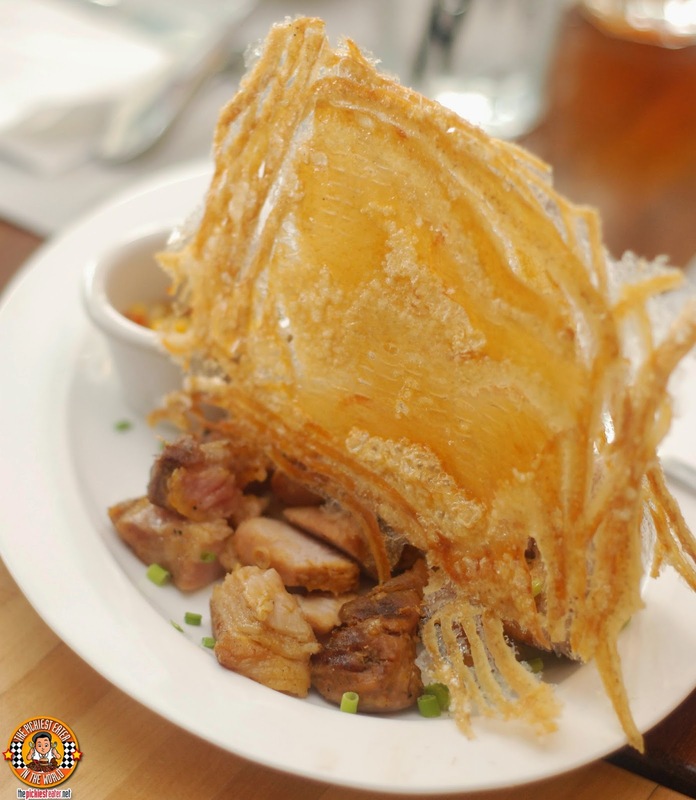 The Pork inasal with lechon skins (P275) is one of those dishes. This was remarkably tender lemongrass marinated, grilled pork steak, served with thin, crispy lechon skins, perched over it, making it look like a member of the Spanish Armada. This is served with lime-patis sauce and pickled corn. 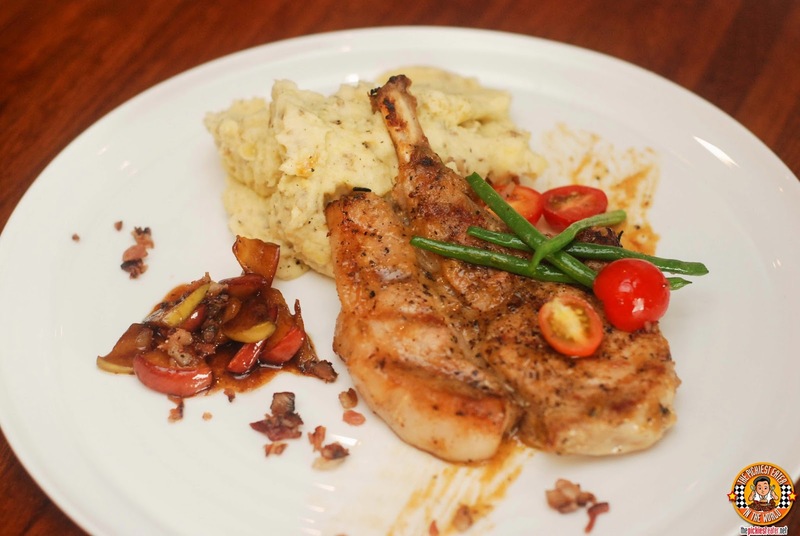 Dulcelins Thick Cut Pork Chop (P295) is a testament to how delicious food need not be complex. It's a thick bone-in pork chop, armed with a beautiful lining of fat on the side, and marinated in miso and mirin, which compliments the flavor of the pork. The chop is then served with miso corn rice or truffled mash.. Can't go wrong either way. Another winner was the Braised Veal Shanks (P550 Good for sharing). 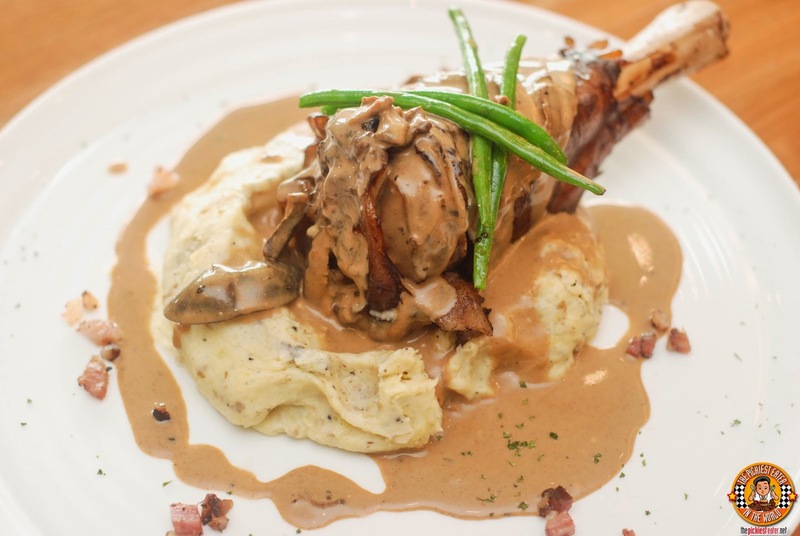 This was an incredibly tender Veal shank, laying on a bed of either truffled mashed potatoes, and smothered in a creamy porcini cream sauce. 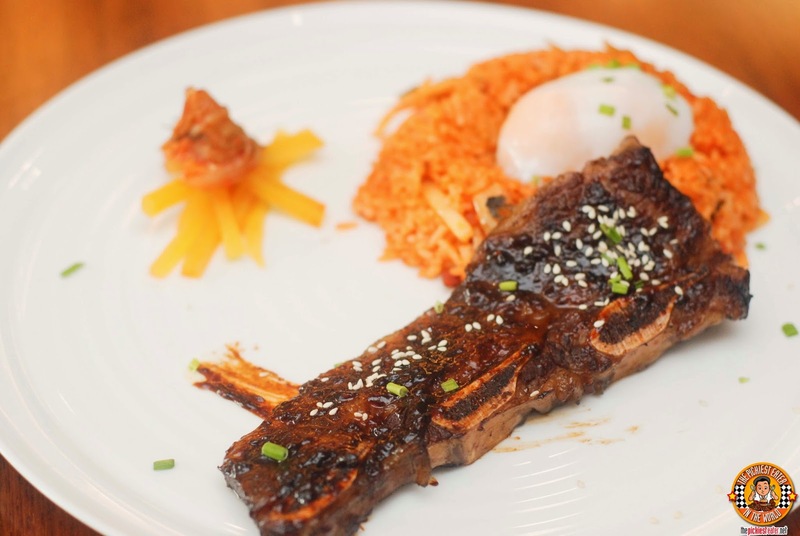 Another one of the dishes that I really enjoyed was the Kitayama Wagyu Short ribs with kimchi rice (P320). This was immersed in a lightly sweet Korean marinade, and the Kimchi Rice had a perfectly cooked Six Minute get nestled on top of it. Seeing the Apple and Hickory Smoked Bacon Slabs (P285) nearly brought tears to my eyes. Even just the aroma was practically a meal in itself. 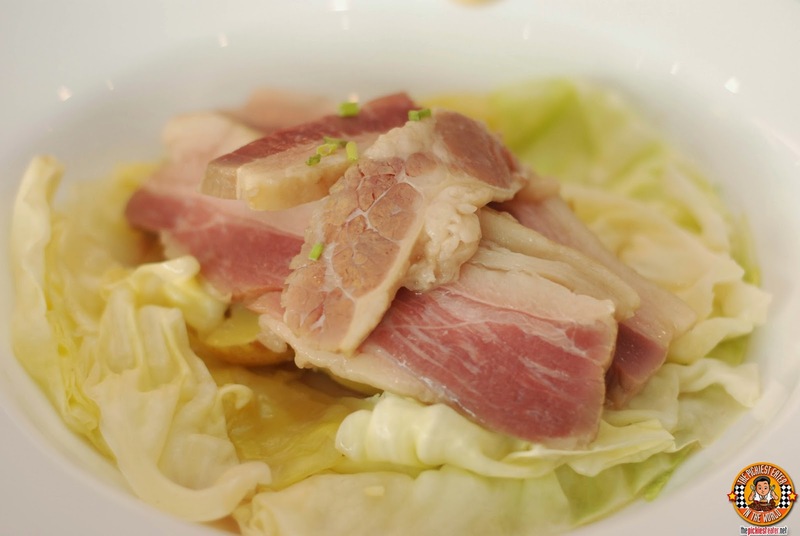 The bacon is a thicker cut, then smoked and slow-cooked. 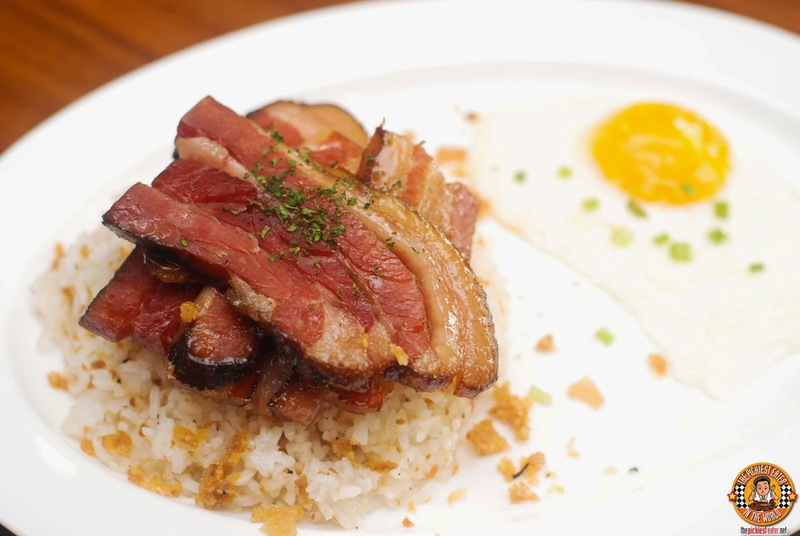 Afterwards, the bacon is then slathered in a luscious honey and bourbon glaze, then served with lechon skin garlic fried rice and an egg (either sunny side up or scrambled). 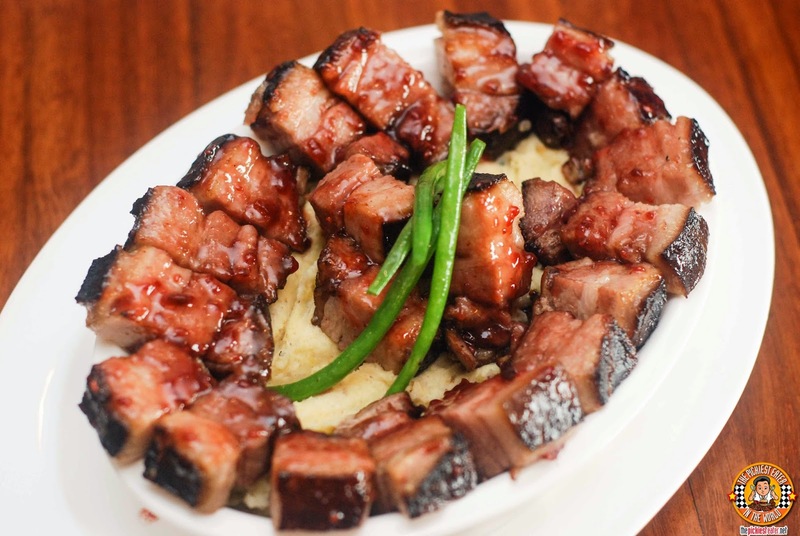 Perhaps the most mindblowing dish I tried that day, was the Apple Wood Smoked Dashi Brined Kurobuta Pork Belly in a Raspberry Chipotle Glaze, laying on a bed of pillowy soft mashed potatoes. And yes, it tasted as amazing as it sounds. 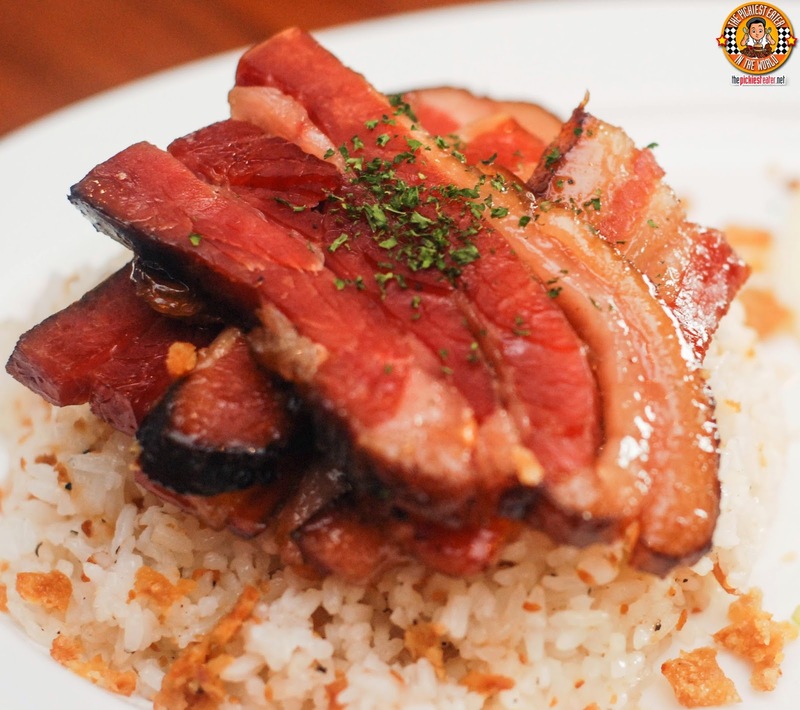 The Pork Belly simply melted in your mouth, and the innate smokiness of the meat worked harmoniously with sweetness of the glaze, that had the right touch of heat that seems to make itse presence felt at just the right times. I have no idea when it'll be added to the menu, but when it does, you can expect me to drop what i'm doing, and head straight to Katipunan. I began my Dulcelin dessert odyssey by attacking the Irish Cream Flan Cake (P130 per slice / P1,200 whole). 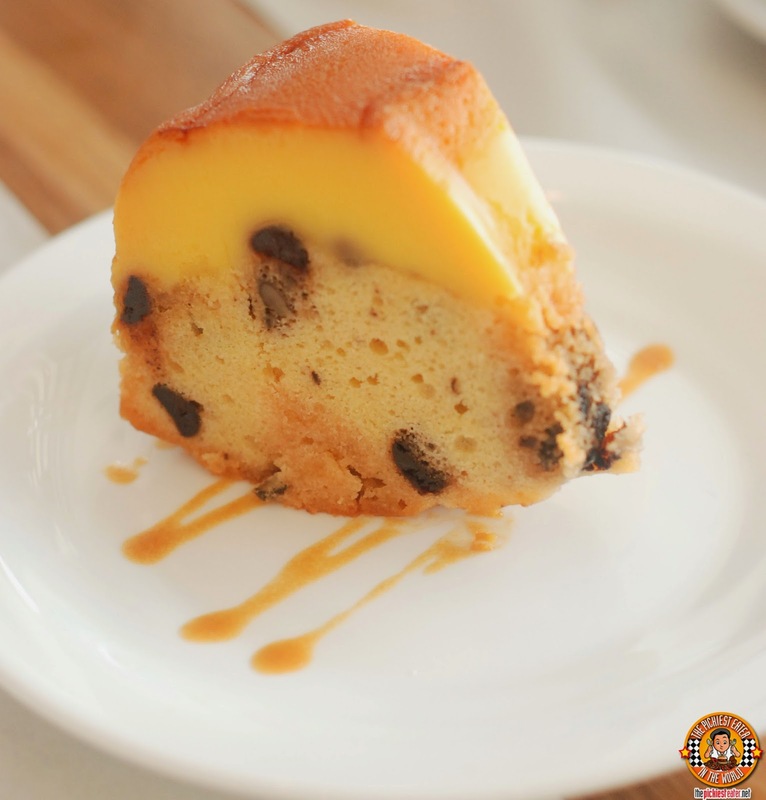 The was an amazingly buttery pound cake, peppered with nuts and chocolate chips, and topped off with a creamy flan. My tag team partner, Rina, attacked the Callebaut Chocolate Ganache Cake (P165 per slice / P650 whole) with reckless abandon. The dark Belgian cake, coupled with the rich, chocolate mousse filling, was more than enough to get her eyes rolling to the back of her head. 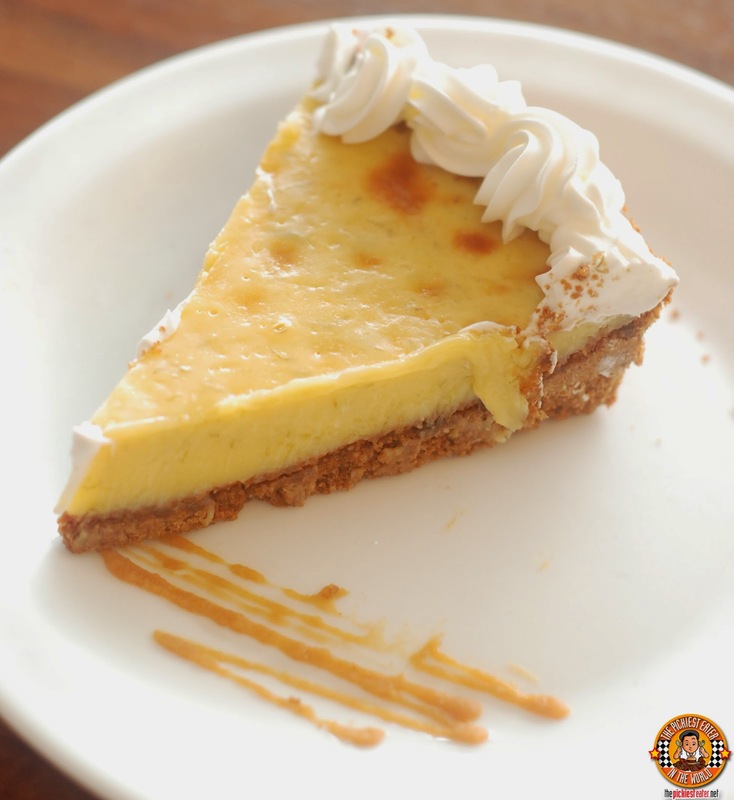 Though it was obviously a well crafted dessert, I found the Key Lime Pie (P95 per slice / P500 whole) a bit too tart for me by just a smidge, although the buttery graham crust was faultless. 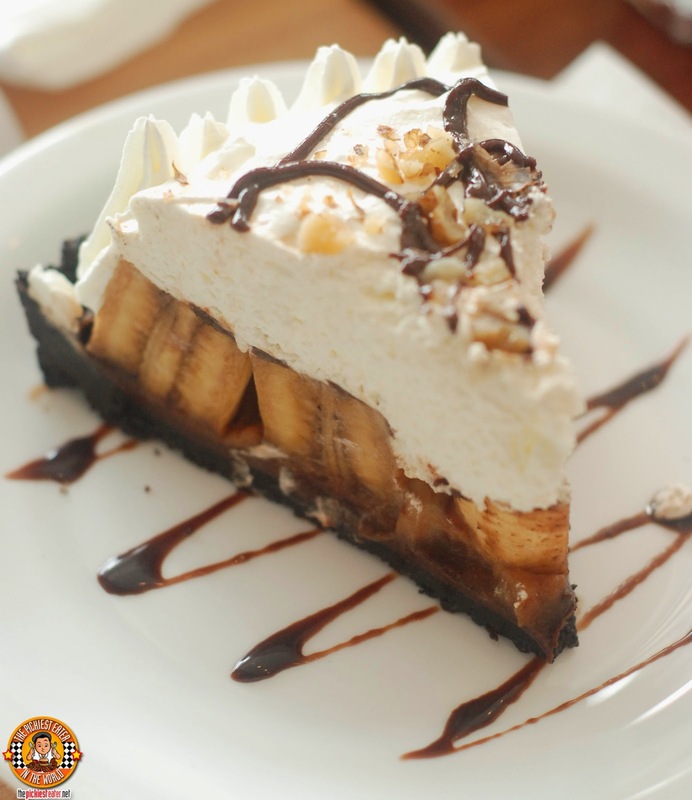 What I did love, was the Banoffee Pie (P145 per slice / P770 whole). The Banana Toffee filling had just the right amount of sweetness, not going overboard despite the fact that it had Dulce De Leche and Nutella in it. 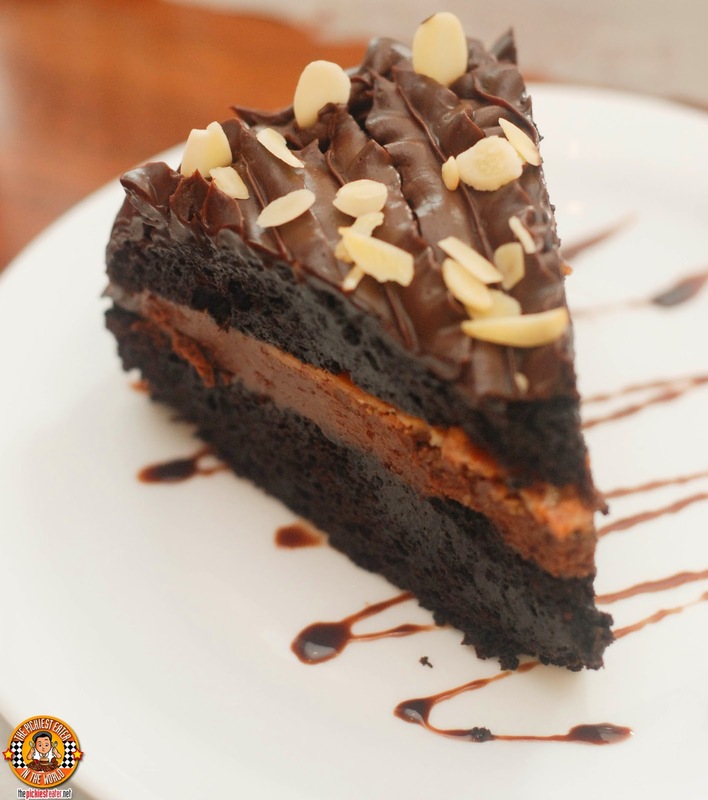 The Callebaut Chocolate Ganache adds the chocolately touch to it, and is further enhanced by the Oreo Cookie Crust. 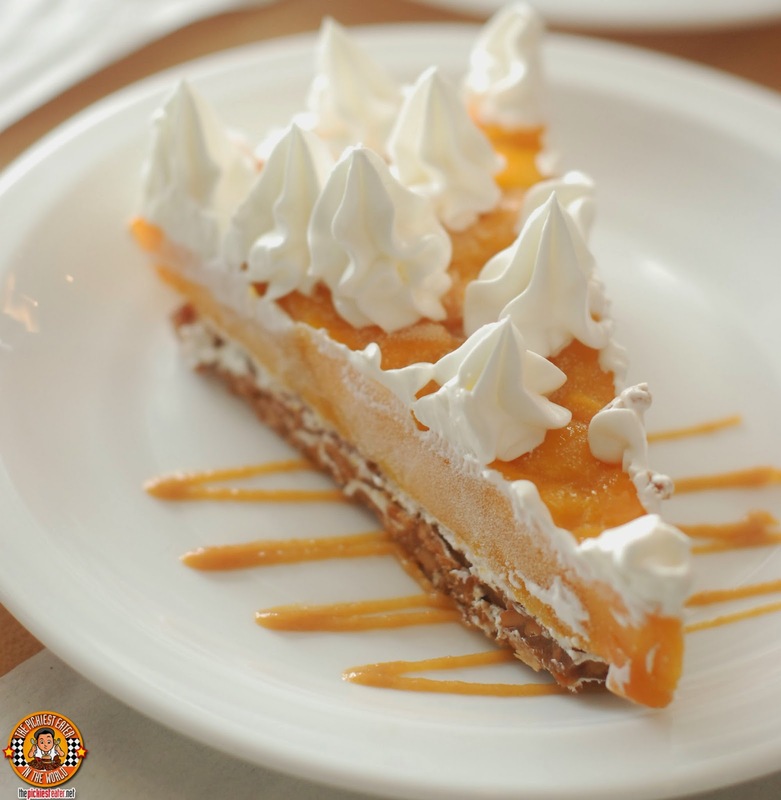 No Dulcelin experience is complete without trying the dessert that put them on the map - The Mango Torte (P140 per silce / P750 for 9" / P1,100 for 12"). The frozen golden mangoes are sandwiched between a delicious cream topping, and a Crispy chewy nougatine. With its delicious menu comprised of mouthwatering gourmet meals, I can safely say and it was everything I had hoped for and more! I highly recommend Dulcelin Gourmet, and I can't wait to go back! Haha don't worry Donna..I don't blame you! Writing it is extremely difficult cuz I get hungry all over again! May fave too..ang walang kamatayang lengua!